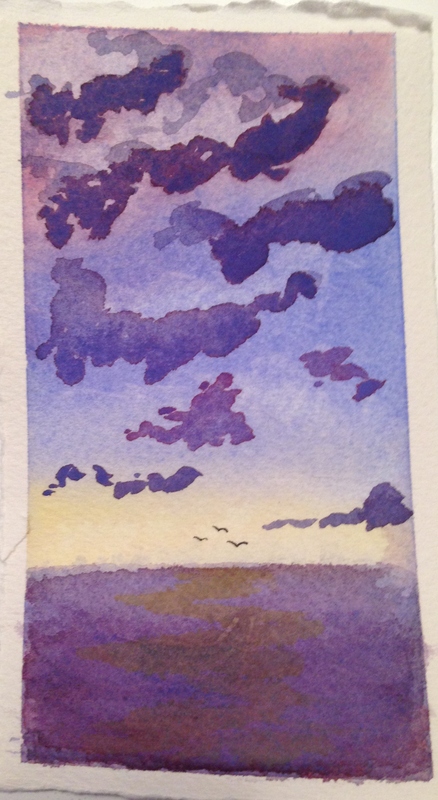 Watercolor really is zen. Why, you ask? I’m learning to make friends with Plan B. This was supposed to be a boat painting. Aaahhh……plan B…a nice peaceful, boatless scene. It’s about 2.5″ by 5″. Cobalt blue, winsor red and azo yellow. Bit of ultramarine blue too. I kinda like the sky. And the sun is dancing on the water. Purple water! Purple paint puddles! These are all good things. I wish you a good Tuesday, lots of big belly breaths….and may you be happy with your Plan B. Peace. Purple…once again we are in the same zone. Very peaceful. And yes the sky is dancing. Nina here and loving this. Reminds me of a Japanese print. Such an insightful way to describe watercolor painting and such a great association with life. Such great wisdom! And the painting turned out beautiful. Couldn’t have planned it more lovely. Don’t you just love that! I’d say that plan B is the best plan. I can just imagine that we are on the boat looking out at the expansive sea. Beautiful painting. I’m really liking your Plan B. I like the whole idea of Plan B. I find this scene quite soothing. Just beautiful and peaceful. You planned a boat? I know it’s there….it’s just a submarine! loving the colors in this! you’re really getting the hang of it! Thank you! I’m trying hehe. This one bombed but watercolor does this to me a lot. Less often now, but it happens and I have to learn to make something else that I still like out of it. 🙂 I’m glad you like this! Thank you Jill! Love the purples always! I’m glad you like it. I had to make something out of it. I did learn that Winsor red doesn’t lift like cad red does. Hehe. Me any lf my substitutions. Oh well live and learn! it really is so lovely. It conveys a mood so perfectly. You’re too kind! Thank you, Lance. Love the purple. I’ve gone to plans C and D…..lol. It’s lovely, whatever the plan. Thank you so much! I’m really feeling better about this one after so many nice comments. I admire the light on the horizon, the twirly clouds, and the reflection in the water. Who needs a boat, anyway? The clouds are beautiful, well done! I see the boat, shrouded by fog in the bottom right corner with a beautiful sunrise breaking over the water. By the way, I nominated you for the Versatile Blogger Award. I always like seeing your work and all the positive energy you bring with it! Thank you, Debi! I have a lot to learn, but I’m glad you liked it!